Several weeks ago I found myself in Orlando, FL for the annual NASPA-FL Drive-In conference at the University of Central Florida. I had never been to a drive-in conference before so I wasn’t really sure what to expect. Something unique about this trip was that I was heading down to present with my friend and colleague Patrick Heneghan, a Residence Coordinator at Florida State. 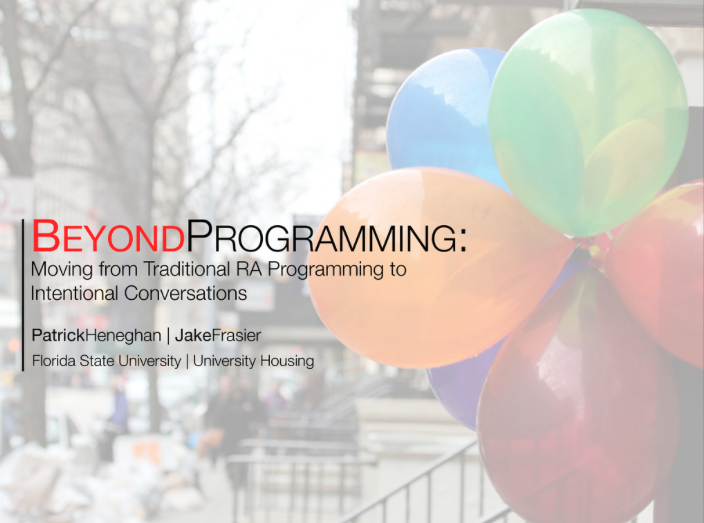 He and I were accepted to present on an RA programming model we adapted and had been piloting since July 2013. The feel of the NASPA-FL conference was different from the national ACPA conference which I attended earlier this year. The NASPA-FL conference had just over 300 attendees, which made a very intimate conference as many of the attendees knew each other; I saw many reunions, hugs, and coffee catch-ups while walking around the conference location. After lunch I was able to attend two different concurrent conference sessions, with one focusing on strategic planning and the other on guiding students through the conduct process. While both presentations were interesting, I was left wanting more tangible take-aways I could bring back to my position and institution. The last concurrent session of the day was when Patrick and I were slated to present. As we geared up to begin our presentation, we had about 25 attendees present to hear us speak. Our presentation went really well as we had a lot of participation from the audience during the session and spoke with several people afterwards to answer questions about our program. My biggest take-away from the presenting experience was how much it made me feel like a professional. As a second year graduate student I don’t think I realized that I’ve had a year of experience and knowledge acquisition and am beginning to become experts in my specific interest areas. It was great presenting on something that I was not only interested in, but also helped implement on our campus. I really felt a sense of ownership and authority when talking about our topic to other conference attendees. Overall I would say the NASPA-FL drive in was incredibly beneficial. I was able to really develop professionally by presenting on a topic I was interested in, and even got to meet several professionals outside of Florida State. I would encourage anyone who is interested in presenting or attending a conference to step outside of their comfort zone and present at smaller regional conferences as a means of practicing. Posted on November 4, 2013 by HESA Admin.